Oh, Maggie Stiefvater, how I adore you more and more with each books of yours I've read! I'd been resisting reading Lament for a very long time (despite a lot of praise from other bloggers) as I really, really don't seem to get a long well with fey in my fiction. Faeries and I just don't seem to get along, or so I thought. Because there are authors who are able to dodge past my faerie-hating ways and make me grudgingly change my mind. And Lament by Maggie Stiefvater is such a book. I'm not entirely sure that I even knew what Lament was about before I started reading it. I'm not even sure why I picked it up, as all I knew about it is that it is a book of faeries. But pick it up, I did, and I put my hand up right now and admit freely that I was wrong. All my misconceptions about this book were competely without foundation. As soon as I started reading, I felt immediately hooked. I loved Dierdre's anxiety and nerves before performing in front of an audience as stage fright is definitely something I can relate to. I love the way in which music plays such a large part of the narrative, and that Dierdre is, unusually a harpist. I love all of the characters from Dierdre, to Dierdre's best friend, the very funny and adorable James, to her grandmother and oh, especially Luke Dillon, the mysterious boy who swoops in and convinces Dierdre to perform a duet with him. And with the arrival of Luke, strange things begin to happen. Because Dierdre is an unusual girl who the gift of seeing faeries. Her huge amount of musical talent means that Dierdre is caught between two faerie assassins and everything will change. 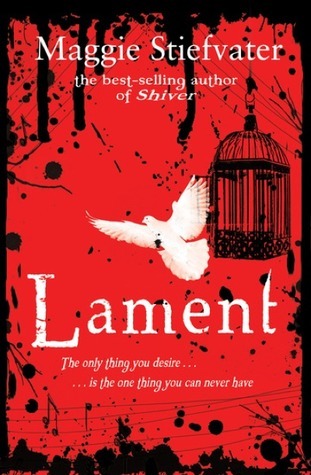 Lament is hugely exciting and fast-paced with all the twists and turns but for a lot of the book it felt like the faerie intrigues were just the background to the brilliant characters. I felt really emotionally connected to the three main characters, Dierdre, James and Luke and my heart beat wildly at not knowing what could happen to any of the three. I'm absolutely dying to read the sequel, Ballad, and will eagerly read anything that has ever or will ever be published by Maggie Stiefvater! Even (especially!) if it's about faeries. I love your review and I completely agree, I will read ANYTHING that awesomely talented woman writes. You will love Ballad and then you can join the crowds pining for book three. Maggie when will you put us out of our misery?! Oh, so very glad that you loved Lament. I've just recently bought a copy and can't wait to dive into it. I must admit that as much as I love fairies, I've also been disappointed by fae books in the past (The Wicked Lovely series in particular), so hearing such high praise about Lament definitely makes me want to read it even more now! Fantastic review Michelle! As much as I loved Lament, Ballad was my absolute favorite. Great review. I'm glad you enjoyed Lament. I would love to read this, I'm glad you enjoyed it! Don't you just it when a book surprises you?! Fantastic review! How awesome that it exceeded your expectations like that! Tammy - I didn't get on very well with the Melissa Marr books either (I read the first two with no problems, but struggled to find my feet in the third book and have since given up on the series!) but this one is a definite YES to reading. Linda - So Ballad is even better? Excellent to hear! Jenni - Yes, it was! Fantastic.